The variety of flavours used in Guizhou cuisine means that, no matter what you fancy, there’ll be a local snack to satisfy your craving. Whilst the snacks in other provinces may strike us as far too large to simply be called snacks, the ones in Guizhou have been perfectly portioned to pack a big punch in a small package. The key to the potency of these snacks is in their liberal use of seasoning, which adds layers of flavour that one wouldn’t expect from such a small dish. We’ve included here just a few of the tastiest morsels that you might encounter on your travels in Guizhou. These crispy bean curd balls are a beloved local snack throughout Guizhou province. 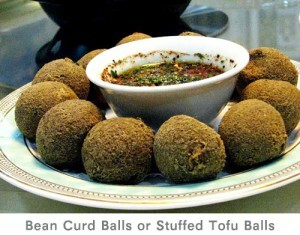 Tiny balls of tofu are rolled up and fried until they are golden brown on the outside and tender on the inside. Sometimes pork mince and green onions are chopped up and stuffed into the bean curd balls to add extra flavour. Traditionally bean curd balls are served with a sauce made from crushed chilli powder, soy sauce, sesame oil, vinegar, pepper and chopped green onions. 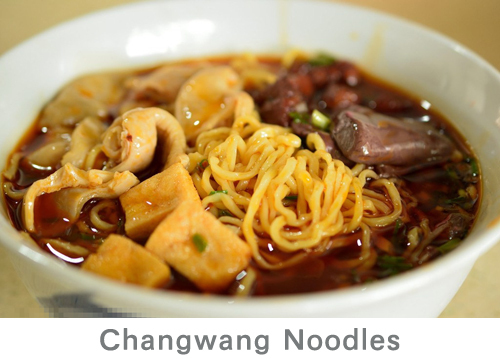 Changwang noodles are the breakfast of choice for most Guizhou locals. The noodles themselves are made from eggs, and are gently boiled in water before being scooped up and delicately ladled into a bowl of steaming chicken broth. The noodles are then garnished with cooked pork offal, blood curd, crispy diced pork, green onions and chilli oil. The crispy slices of pork, the soft blood curd and the aromatic soup all come together to make a dish that is frankly far too delicious to just have for breakfast. 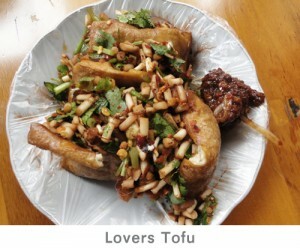 The name “Lovers Tofu” was adopted during World War II. This snack was frequently used to stave off hunger when locals were waiting for the all-clear after an air raid siren sounded. Supposedly, since these moments also allowed local men and women to mingle freely and frequently resulted in the development of romantic partnerships, the tofu was aptly dubbed “Lovers Tofu”. The recipe for Lovers Tofu varies from vendor to vendor, but traditionally it consists of a square of tofu, about the size of your palm, that is gently grilled until it is golden brown on the outside but still soft on the inside. The vendor then slices open the centre of the square and fills it with finely chopped zhe ergen and a sauce made from red chillies, soy sauce, vinegar, sesame oil, garlic and ginger. 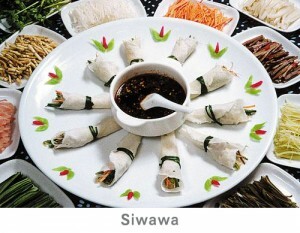 The name Siwawa literally means “silk doll” in Chinese and is derived from the appearance of this snack, which supposedly looks like an infant swaddled in cloth. First you take a thin rice-flour pancake and liberally fill it with shreds of vegetables like seaweed, radishes, bean sprouts, cucumber, zhe ergen, and fried soybeans. Chilli paste is added last and the pancake is then rolled up. The vendor will usually add some sauce to the pancake to taste. This snack is an explosion of flavours, spicy and sour, crispy and wonderfully refreshing. 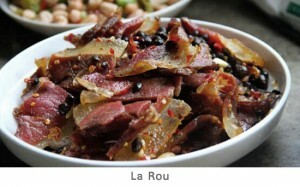 La Rou is a kind of bacon that originated from the Miao ethnic minority. The local Miao people allow their pigs to roam freely because they believe this will keep them fat and happy. They cure and smoke the bacon in their own homes, which gives the bacon its distinctively salty, succulent and smoky flavour. Blood curd: A gelatinous curd, like tofu, made from the blood of an animal, usually a pig. Its flavour resembles that of British black pudding, but its texture is much softer. Zhe ergen: An edible root that is usually found growing near rice fields. It’s said to have a fresh, peppery flavour and a satisfyingly woody crunch, although some people describe its flavour as medicinal and bitter.